There are many ways to build a castle with children. 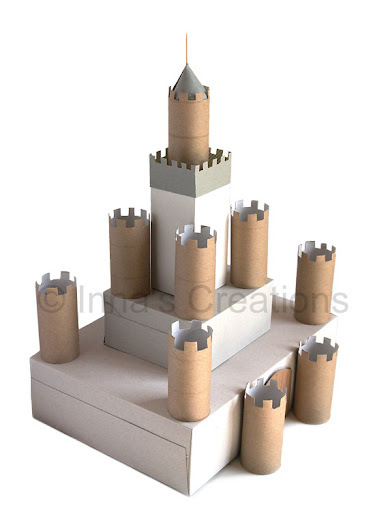 Once I already made a small cardboard toy castle with my kids, but this time we wanted something more impressive. For our castle we collected cardboard boxes of different size, and toilet paper tubes. 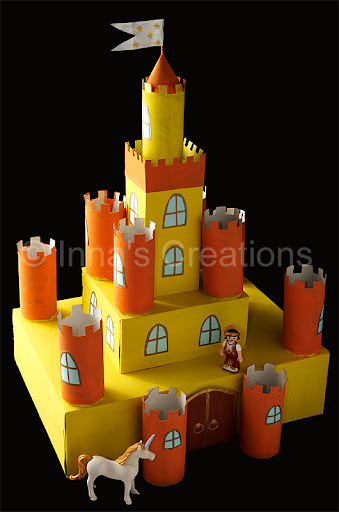 Using those building blocks, paint and some colored paper, we created this castle with floors, round towers, windows and a cone-shaped roof. This project is very easy and straightforward. Reverse the boxes, stack them one onto another, put the toilet paper rolls at the corners, paint. Place towers also at the top and around the gate. I showed how to make a cone in my post about gigantic pencils, the cone-shaped roof can be made the same way. A flag from a toothpick and piece of paper is the final touch. 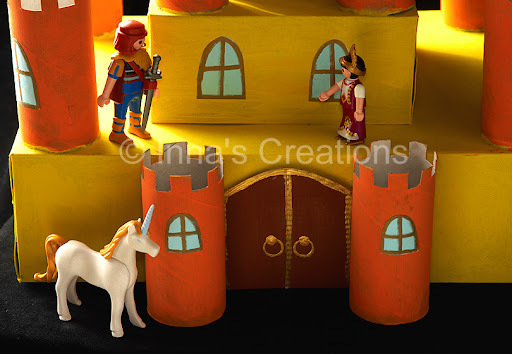 I think you may enjoy the Cardboard castle by Ann Wood. It's more of a piece of art than a kids craft project. Take a look. So simple and so magnificent! So cute, I would have loved making this as a child, I loved fairy tales! So, (even though I am all "grown up") I will try to make one with my grandkids! They will love it too! What a great project for you and your children to make together. I hope they've had fun playing with it. Thanks everybody! It's fun indeed, and not only playing with, but making, too. This is so cute! I will try to make it for my history project/homework, although I'm going to need some help in making it! WOW you really have a creative eye, those castles look amazing! I havent seen anything as cool involving cardboard boxes and art combined. Well done. It's really creative and easy to make. I would definitely like to try it with my kid. Nice Creation. Easy to make. My little bro loves it and wants to make one for his teacher. I am so making this for my sons cupcake stand for his knights birthday! I was wondering how to be creative to display. This is it! Was wondering how to display cupcakes for sons knight bday. This is it! Love it and it is something we can make together.